The Watershare CoP on Subsurface Water Solutions is dedicated to sharing scientific and practical experiences in the fields of aquifer storage and recovery (ASR), managed aquifer recharge (MAR) and other subsurface water solutions. The CoP focuses on variety of rural and urban challenges, centralised and decentralised water systems, with different source waters, operational challenges, policies and regulations. The CoP’s experiences have now been aggregated in a Knowledge Environment, which will be officially launched next September at IWA Tokyo. The Knowledge Environment will include several Technology and Economic guides to aid in the design and realisation of solutions like ASR Coastal, Freshmaker and Freshkeeper. The Knowledge Environment and design tools have been developed within the EU Horizon 2020 project SUBSOL – bringing coastal SUBsurface water SOLutions to the market (http://www.subsol.org/). This project concludes this August, after which these and related tools will be migrated to the Watershare community. 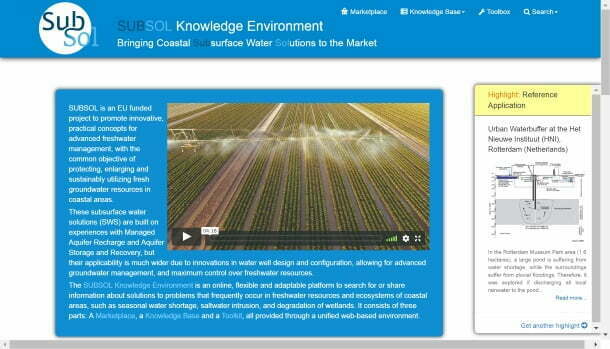 A preview of the Knowledge Environment, developed amongst other by Watershare partners NTUA and KWR, can be found at http://subsol-data.euprojects.net/.